KALMATRON® KF-αβγ ADMIX and KALMATRON® KF-αβγ COAT are radiation shielding materials (RSM) for Attenuation of Radiation and Liquid Impermeability. They are non-organic cementitious gray powders without odor and dry bulk density at 1,300 Kg/m3 for ADMIX and 1,500 Kg/m3 for COAT. ADMIX is applicable as an additive to the regular concrete mixes in a range from 35 Kg /m3 to 100 Kg/m3 after evaluation of required level of Radiation Attenuation. Being added into concrete mix ADMIX provides following concrete properties. Workability and pumpability without Superplasticizer. Adhesion to applied surface without Hardening Accelerators and Water Reducers. Immediate performance of Radiation Attenuation after application. Impermeability to any Liquids after 4 hours of application. ADMIX is applicable as a premix to dry cementitious mixes to be dispensed, strewn, or sprayed in a dry form onto/into the source of Radioactive Contamination (RC). RC could be localized Primordial Radiation, Industrial Waste, damaged or abandoned Nuclear Facilities, etc. Storage, Handling and Application do not require special uniforms, protective devices and special skills. Radiation Shielding by KF-αβγ is easy reparable and replaceable in a case of damages. 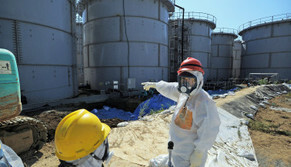 Radiation Protection and environmental situations.